David Agius today came forward officially as a contender for the election of the Nationalist Party’s deputy leader for parliamentary affairs. He is not the sole contender: Edwin Vassallo is in the race too. Nominations close at 6pm today. 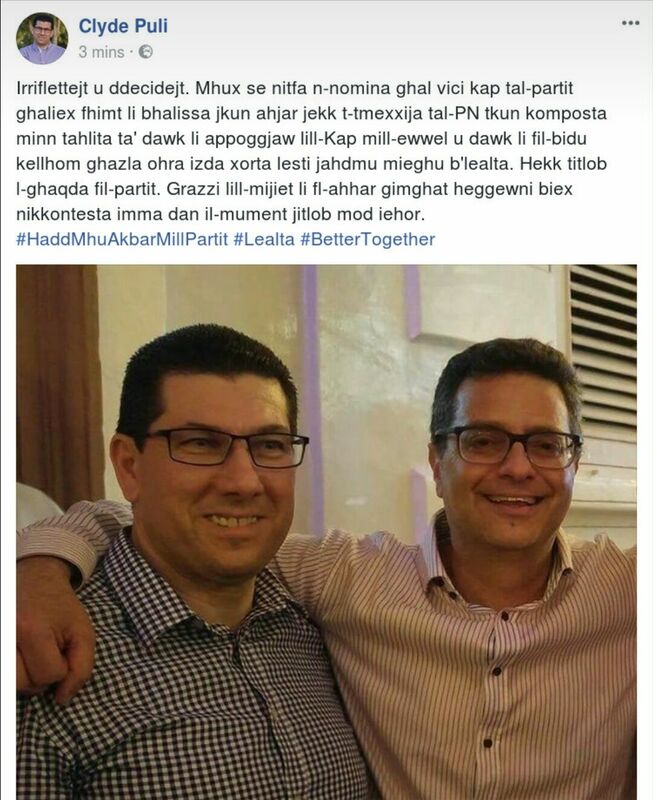 When the Nationalist Party broke the news in a press release a few hours ago, this website rang Chris Said, who Adrian Delia, the party leader, had invited to stand for the post. Dr Said had agreed reluctantly, saying that he would do so only if he is the sole contender. Dr Said confirmed to this website that on the basis of that agreement with the party leader, he will now not stand for election to the post. Mr Vassallo presented no such obstacle, because he has said already that if Dr Said comes forward, he will stand aside. There are two ways of considering this situation. 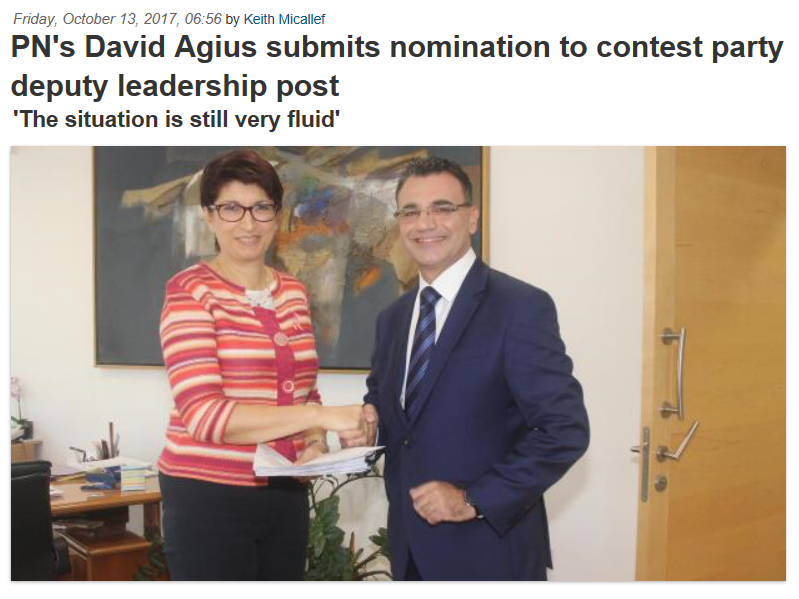 One is that after a weeks of intensive campaigning, David Agius is so determined to become deputy leader for parliamentary affairs that he has defied the party leader’s wish to pull Dr Said on board to make himself look better with disillusioned supporters who are leaving the party in droves. The other is that Mr Agius did not defy his party leader at all, but on the contrary has hatched a scheme with Dr Delia (he is one of his closest allies and collaborators) to keep out Dr Said, who they don’t actually want around, while at the same time making it look like Dr Delia tried to rope him in for ‘unity’. Whichever it is, my considered view is that Dr Said was extremely relieved when Mr Agius, who is not known for his intelligence, threw his hat into the ring at the 11th hour. He would not have wanted to refuse Dr Delia’s invitation outright because it would have come across as querulous, but nor would he want to be embroiled in the evolving mess in the Nationalist Party at a formal hierarchical level. Meanwhile, with just an hour to go until nominations close, Robert Arrigo remains the sole contender for the other deputy leadership role, that for party affairs. Clyde Puli today announced that he wouldn’t be standing for election to that role after all, saying more or less that he respects the party leader’s wish to have one deputy leader from his camp and another who had supported his electoral rivals. When David Agius put himself forward formally for the one role, which meant Chris Said’s exclusion, it followed that the other role could not be taken up by Mr Puli, who is also a close collaborator of Dr Delia’s. It also assumes that Edwin Vassallo is also one of Dr Delia’s backers or that Mr Agius is bound to win against him. Robert Arrigo did not campaign for Dr Delia. The election takes place on 18th November.